A constitution, as Solon said, is good for a certain people and for a certain time. It shouldn’t be mummified. - Charles de Gaulle. A constitution is a set of fundamental principles or established precedents according to which a state or other organization is governed. These rules together make up, i.e. constitute, what the entity is. When these principles are written down into a single collection or set of legal documents, those documents may be said to comprise a written constitution. The problem in any constitutional change is the great care put to solve the problems of the past instead of grasping those of the future. (fr) Le défaut inhérent à tout changement constitutionnel tient au grand soin mis à régler les problèmes du passé au lieu de saisir ceux de l’avenir. A constitution, as Solon said, is good for a certain people and for a certain time. It shouldn’t be mummified. (fr) Une constitution, comme disait Solon, est bonne pour un peuple et pour un temps. Il ne faut pas la momifier. (fr) Une constitution, c’est un esprit, des institutions, une pratique. Edward Gibbon, History of the Decline and Fall of the Roman Empire (1838), chapter 3, third paragraph, p. 33. If a written constitution is not in close accord with the way the society itself is constituted, it will be irrelevant to the everyday life of the people. A constitution will be a failure if it is no more than a beautiful portrait of an ugly society. But it must be more than an accurate depiction of how the society is constituted. A good constitution provides guidance and structure for the improvement of the society. A good constitution is designed to make the political society better than it is and the citizens better persons. It must be enough like the institutions and the people to be relevant to the working of the society, but it should also have what might be called formative features, a capacity to make us better if we live according to its provisions and adhere to its institutional arrangements. Alexander Hamilton, Speech in the United States Senate (June 28, 1788), reported in Henry Cabot Lodge, ed., The works of Alexander Hamilton: Volume 2 (1904), p. 80. 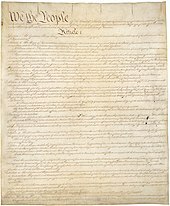 Constitutions are intended to preserve practical and substantial rights, not to maintain theories. Oliver Wendell Holmes, Jr., Davis v. Mills, 194 U.S. 451, 457 (1904). Now and then, an extraordinary case may turn up, but constitutional law, like other mortal contrivances, has to take some chances, and in the great majority of instances, no doubt, justice will be done. Oliver Wendell Holmes, Jr., Blinn v. Nelson, 222 U.S. 1, 7 (1911). By reducing too the faculty of borrowing within it's natural limits, it would bridle the spirit of war, to which too free a course has been procured by the inattention of money -lenders to this law of nature, that succeeding generations are not responsible for the preceding. On similar ground it may be proved that no society can make a perpetual Constitution, or even a perpetual law. The earth belongs always to the living generation. They may manage it then, and what proceeds from it, as they please, during their usufruct. They are masters too of their own persons, and consequently may govern them as they please. But persons and property make the sum of the objects of government. The constitution and the laws of their predecessors extinguished then in their natural course with those who gave them being. This could preserve that being till it ceased to be itself, and no longer. Every constitution then, and every law, naturally expires at the end of 19 years. Thomas Jefferson, letter to James Madison (September 6, 1789); reported in Thomas Jefferson Randolph, Memoirs, Correspondence and Private Papers of Thomas Jefferson (1829), volume 3, p. 31. Some men look at constitutions with sanctimonious reverence and deem them like the ark of the covenant, too sacred to be touched. They ascribe to the men of the preceding age a wisdom more than human and suppose what they did to be beyond amendment. I knew that age well; I belonged to it and labored with it. It deserved well of its country. It was very like the present but without the experience of the present; and forty years of experience in government is worth a century of book-reading; and this they would say themselves were they to rise from the dead. Thomas Jefferson, letter to H. Tompkinson (AKA Samuel Kercheval) (12 July 1816). I am certainly not an advocate for frequent and untried changes in laws and constitutions. I think moderate imperfections had better be borne with; because, when once known, we accommodate ourselves to them, and find practical means of correcting their ill effects. But I know also, that laws and institutions must go hand in hand with the progress of the human mind. As that becomes more developed, more enlightened, as new discoveries are made, new truths disclosed, and manners and opinions change with the change of circumstances, institutions must advance also, and keep pace with the times. We might as well require a man to wear still the coat which fitted him when a boy, as civilized society to remain ever under the regimen of their barbarous ancestors. The issue of the Constitution is that the text is confusing because it was written more than 100 years ago and what people believe it says differs from person to person and differs depending on what they want to get done. Ezra Klein, "Daily Rundown" show on MSNBC, December 30, 2010. Attributed to Napoleon; reported in John Holland Rose, The Life of Napoleon I (1901), "Œuvres," volume iii, p. 428. Without constitutionalism, a political party can ruin the constitution. This page was last edited on 19 December 2018, at 23:08.